Supply and Demand (in that order): Where's the GDP Disaster? Last October, when we were told that spending and incomes were about to collapse, I predicted that "real GDP will not drop below $11 trillion (chained 2000 $)." 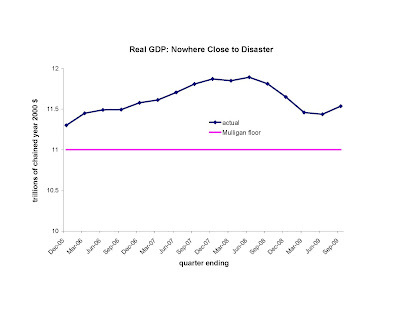 Here is a graph of real GDP during this recession, through September 2009. Admittedly, I had no appreciation last October for the labor market distortions that were emerging (by early November I started to realize that -- see this post), which allowed me to incorrectly predict in October that payroll employment would not drop below 134 million (now it is amount 131 million). But a lot of people (such as the Obama adminstration) overestimated employment and underestimated unemployment, even with the benefit of the data released and public policies implemented after I made my forecast. But were the "Keynesian" economists making predictions? How accurate did they turn out to be? Or were their predictions of the sort that can never be verified? Related to the so-called GDP collapse: Did you know that real consumer spending and real personal income were HIGHER a year after Lehman collapsed?